All of our Jr. High girls took cheerleading! Because Sts. Peter & Paul School is relatively small, every student has the opportunity to participate in all events, from sports to school plays. --Basketball and cheerleading are offered at the school. --Through an excellent relationship with Grangeville Elementary School, football, volleyball, wrestling & track are available. "I appreciate that every 7th & 8th grade girl is a cheerleader. Their uniforms are beautiful and modest and the girls are all having fun cheering together!" The key component of our sports program is our emphasis on sportsmanship. Sts. Peter & Paul students participate in both the regular basketball season and also in the Catholic Hallissey Tournament held in Boise each February. 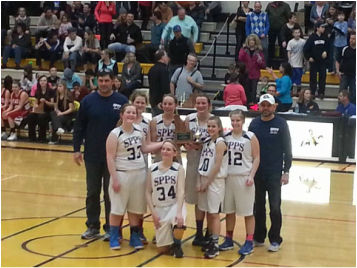 Our girls' team won the Sportsmanship trophy in 2010 and again in 2014! We are very proud that they upheld SPPS' tradition of excellence. A huge benefit of a small school team is that each athlete gets a lot of playing time during games developing great skills. In 2015, we had the winning girls team in the Hallissey Tournament and our boys placed third. In 2012, we had the winning co-ed basketball team at the Hallissey Tournament. Our students become great athletes! We love our new, beautiful gym & activity center built in 2010.